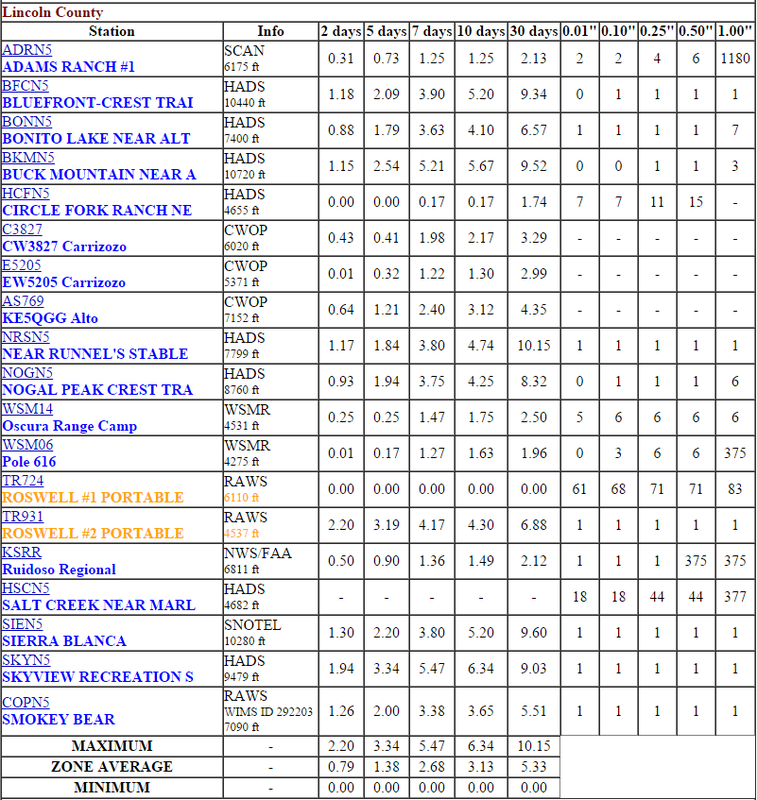 Rainfall Totals & Historic Flash Flooding On Dark Canyon - 9-23-2014. Eagle Draw - US Hwy 285 Bridge In Artesia, NM. Normally Dry Rio Penasco River. 9 Miles SSE Of Artesia, New Mexico. Normally Dry Dark Canyon Arroyo. San Jose Blvd - Carlsbad, New Mexico. San Jose Blvd, Carlsbad, New Mexico. Unfortunately I wasn't able to capture any video of Dark Canyon Arroyo during at its highest flood stage, which occurred just before midnight Sunday, September 21,2014. I was at the Eddy County Emergency Operations Center assisting local official's with weather updates. 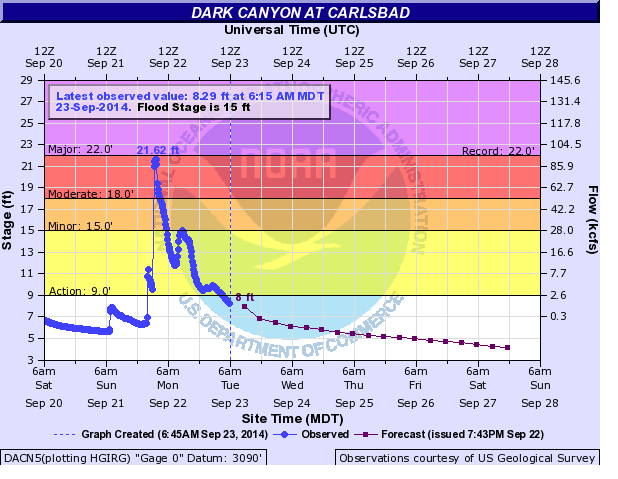 Record/Historic Flooding On Dark Canyon. NWS AHPS Dark Canyon Flood Gauge. 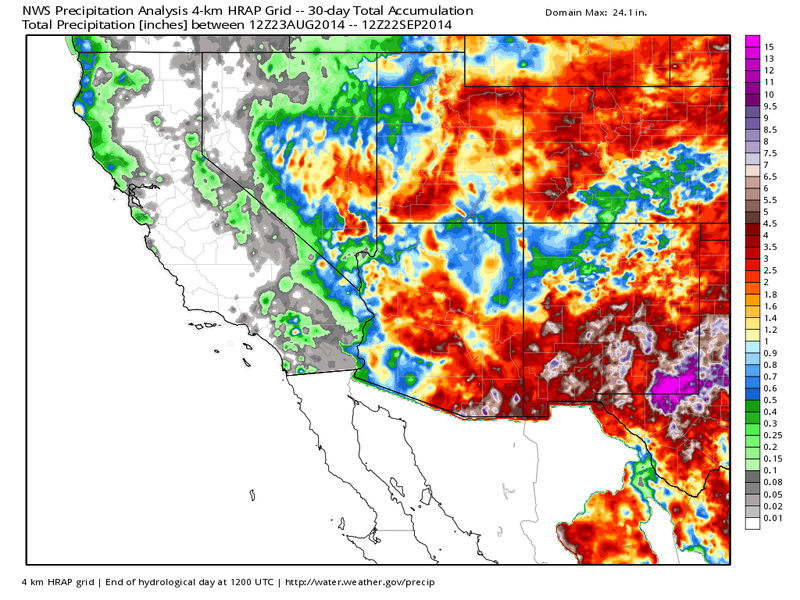 Record/Historic flash flooding occurred in the Dark Canyon Arroyo that runs through the heart of Carlsbad, New Mexico Sunday night just before midnight. The flood gauge water depth in the arroyo peaked at 21.62 feet. This is the second highest depth ever measured in the arroyo. This depth is second only to the August 23, 1966 record of 22.00 feet. At the peak depth Sunday night the water was raging down the arroyo at an incredible 92, 700 cubic feet a second (cfs). I'm not sure but this may be the highest flow on record, if not the second highest. Its believed that an estimated 100,000 cubic feet a second occurred in Dark Canyon during the flash flooding in September 1941. During the flash flood of April 4, 2004 the arroyo reached a depth of 21.62 feet. Last September 12th it reached a depth of 17.85 feet. During the flooding of June 24, 1986 it reached a depth of 12.53 feet. And on September 26, 1980 12.10 feet. There was a great deal of concern that the flood waters were going to top the Canal Street bridge near La Tienda Grocery Store in Carlsbad Sunday night...and with good reason. The flood waters came to within a foot from the bottom of the bridge of doing this. 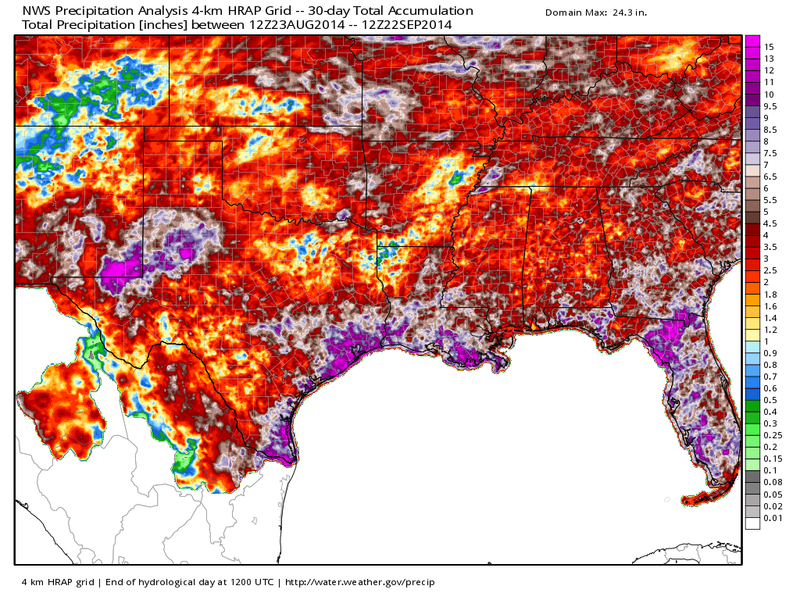 14-Day & 30-Day Rainfall Total Graphic Maps. 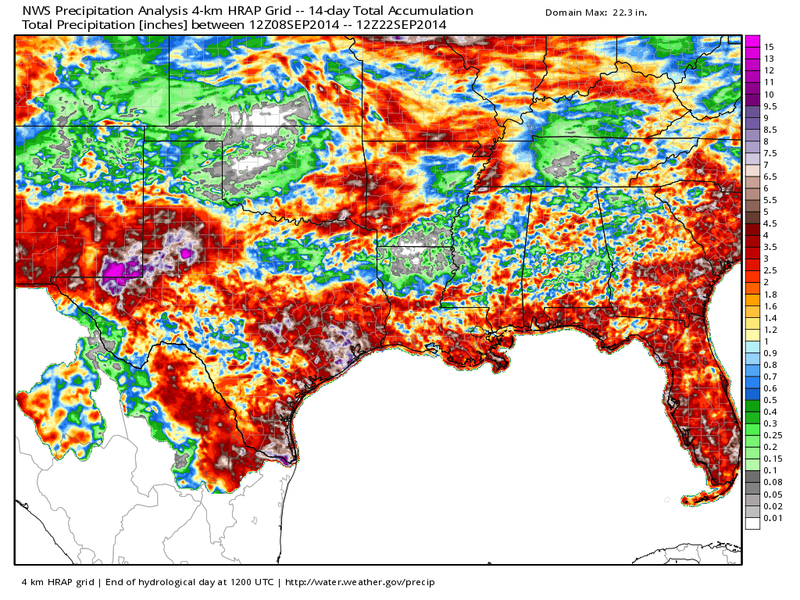 NWS AHPS 14-Day Rainfall Totals. 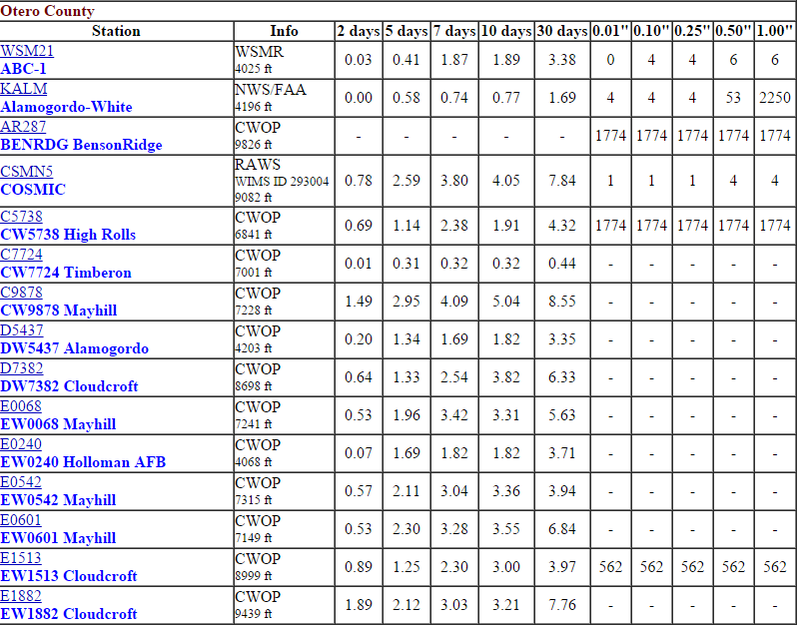 NWS AHPS 30-Day Rainfall Totals. 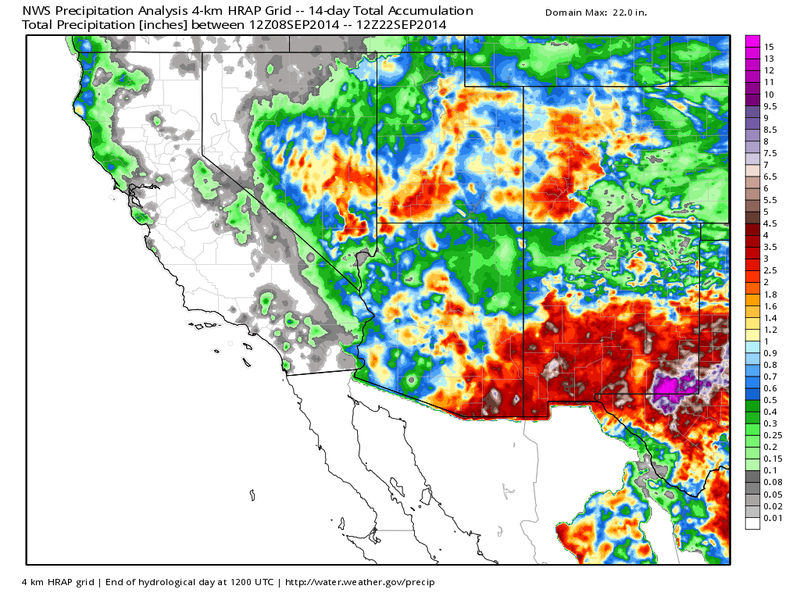 WeatherBell - NWS 14-Day Rainfall Totals. 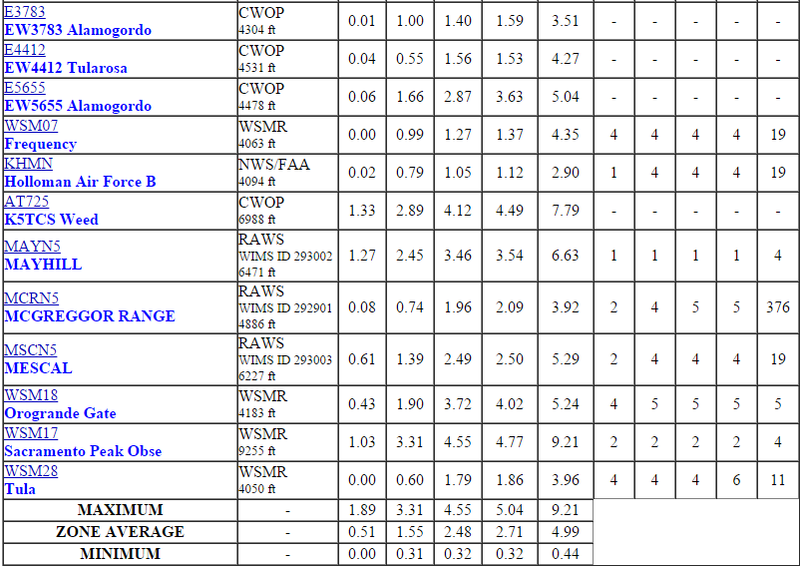 WeatherBell - NWS 30-Day Rainfall Totals. 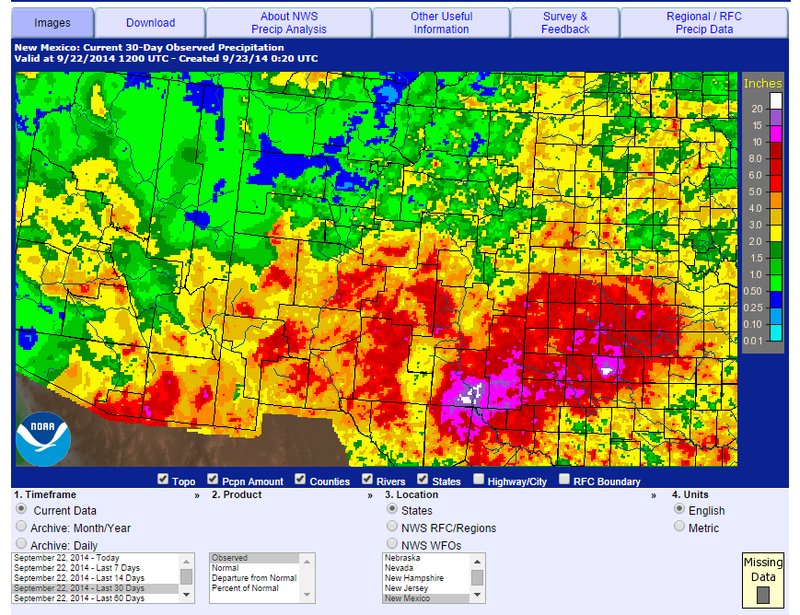 NWS MesoWest 7,10 &,30 Day Rainfall Totals. 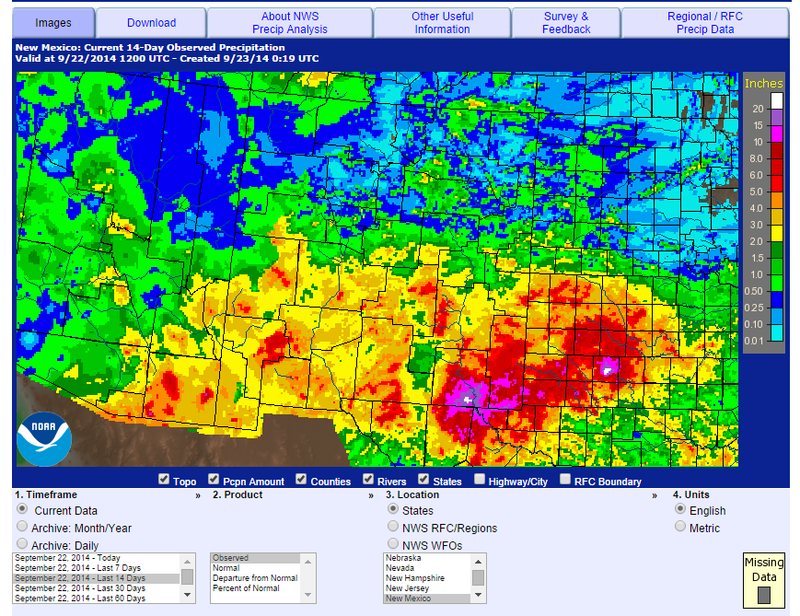 Two week storm total rainfall amounts have exceed 20.00 inches in parts of Eddy County. Here at my home in northwest Carlsbad I measured 8.47" over the past two weeks. 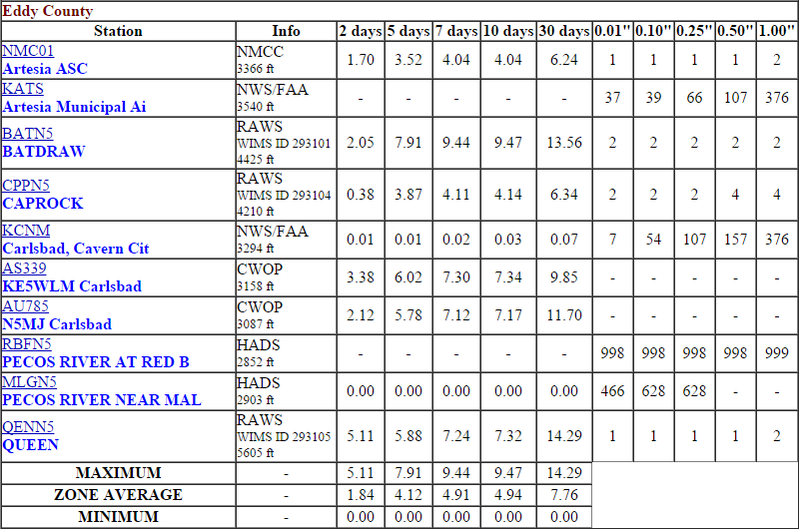 Bringing my September month to date total to 9.68", and my year to date total to 15.48".